Blackheaded fireworm – Blackheaded fireworm eggs overwinter on the bed and usually hatch by around mid-May (at this time of the year). It is important to catch the first generation, if possible, because the second generation occurs during bloom and is typically much more destructive. Blackheaded fireworm larvae can be detected by sweep net sampling and it is a good idea to look along the edges of beds where vines first begin to grow. Remember: blackheaded fireworm is much easier to control if detected during the early part of the season. Sparganothis fruitworm – This insect is a serious pest in most cranberry-growing states. Sparganothis fruitworm completes two generations a year and overwinters as an early-instar larva. 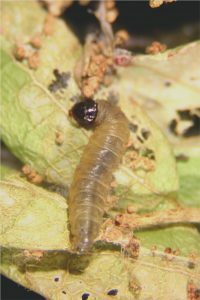 Larvae from the 1st generation feed on foliage. In New Jersey, first generation adult moths emerge from mid-June through the first weeks in July; pheromone traps are commonly used to monitor adult flight and population size. 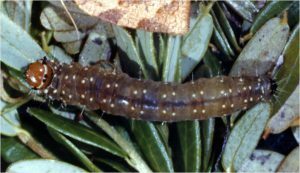 Second-generation eggs are laid on cranberry leaves, and larvae will feed on fruit. Lepidopteran Pests Monitoring and Control – Use sweep netting for monitoring early lepidopteran pests (pre-bloom). A sweep set consists of 25 sweeps and 1 sweep set is recommended per acre (this may vary depending the size of bogs). The action threshold for false armyworm, blossomworm, other cutworms, and gypsy moth (we use a combined threshold from adding all these caterpillars per sweep) is an average of 4.5 caterpillars in sets of 25 sweeps. For brown and green spanworms is an average of 18 per sweep set. 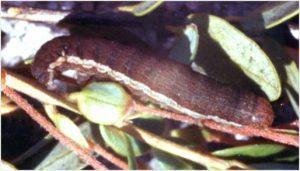 The action threshold for blackheaded fireworm and Sparganothis fruitworm is an average of 1.5 per sweep set. We recommend the use of the reduced-risk materials Intrepid, Altacor, or Delegate if populations exceed action thresholds. These are reduced-risk, softer insecticides that are very effective against lepidopteran pests. More information on these (and other) lepidopteran pests will be provided as the season progresses. 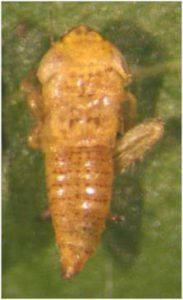 Leafhoppers –There is concern among New Jersey cranberry growers of a potential increase in leafhopper populations because of recent changes in pest management strategies (e.g., adoption of new reduced-risk products and decreased applications of broad-spectrum insecticides). Blunt-nosed leafhopper is of particular concern because they can transmit cranberry false blossom disease. This leafhopper has one generation a year. Adults are found in highest numbers during July, although nymphs or adults may be found from the end of May until October. Eggs are laid in August-September. The eggs overwinter and hatch in May or June. The nymphs go through 5 instars to complete development. We are seeing 1st instars at this moment. Leafhopper Monitoring and Control – Leafhopper nymphs can be sampled using sweep nets (as described above for lepidopteran pests). Nymphs before bloom are small; thus, you may need to freeze the samples (to kill them), and then count the number of nymphs under a microscope or using a magnifying lens. There is no threshold based on sweep net counts, so decisions should be made based by comparing current numbers with prior infestation history and/or incidence of false blossom disease on those beds. In cases of high numbers of blunt-nosed leafhopper nymphs, we recommend application of a broad-spectrum insecticide, such as Diazinon (no aerial applications allowed), Sevin, or Lorsban (only pre-bloom applications allowed for Ocean Spray growers). 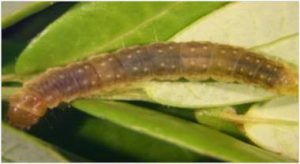 Broad-spectrum insecticides will disrupt biological control particularly the natural enemies (predators and parasitoids) of Sparganothis fruitworm, so their use should be restricted only to areas of high leafhopper populations.